In the early 1930’s, Ezra Battat came to the United States from Europe. Like so many of his generation, he saw in America the promise of personal liberty and golden opportunity. With this classic dream in mind, he started Liberty Gold Fruit Company as a supplier of the highest quality California fruits and vegetables, at fair prices, to consumers overseas. 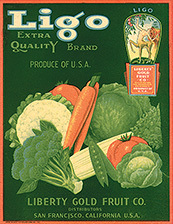 Believing that the real value of goods was in their quality, he would not compromise the high standards of the foods shipped under his LIGO brand (from LIberty and GOld). And as word spread about these excellent LIGO products, so did their markets’ geographic boundaries. Today, Liberty Gold is respected worldwide for its line of sensibly priced products that never sacrifice quality. Over the years, the Liberty Gold name and the LIGO brand have earned a worldwide reputation for excellence. Few international companies have as complete a product line — the LIGO family of products now includes hundreds of items from beverages to vegetables. We have maintained a steady growth by staying on top of changing consumer trends, and constantly being on the lookout for upscale and innovative new items to add to the distinguished LIGO and Liberty Gold brand lines. Still family-owned and operated and into its third generation of the Battat family, Liberty Gold Fruit Company is one of the few privately owned companies left in the industry. Liberty Gold is continuing the family ideals through day-to-day involvement of management in all phases of company operations and promoting a company-wide priority to customer service.